Vroom! Vroom! The roar of the engine is so loud, but it's also exciting. NASCAR race cars zoom around the track at speeds of over 200 mph. Many Missourians enjoy watching NASCAR. Most will tell you they cheer for Jamie McMurray. Jamie McMurray is a famous Missourian and also one of the best NASCAR drivers racing today. 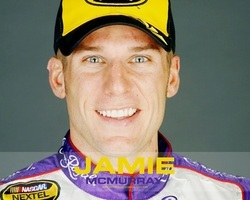 Jamie McMurray was born June 3, 1976 in the small town of Joplin, Missouri. Jamie spent his childhood and teen years growing up in Joplin, Missouri. Jamie's love for racing began early in his life. He began racing go karts at age 8. For example, he won his first go cart title at age 10 and he won the World Go Karting Championship at age 15. Jamie's skill for raising developed early and he was considered to be one of the youngest racing stars. Jamie's fame for racing began to grow. In 2002, he replaced an injured driver. After this he moved up to full-time status. The following year he recorded five finishes in the top five. He finished 13th and points standings. He was named 2003 rookie of the year. Jamie's NASCAR accomplishments spurred his rise to fame. For example, in 2004 he received a $1 million prize for finishing 11th in point standings. In 2005, Jamie scored four top five's and 10 top tens and finish 13th in points. In 2006 he finished 25th and points. In 2008 he finished 17th, and 2008 he finished 16th and total points respectively. These accomplishments helped Jamie's fame grow and soon he had thousands of fans cheering him on. Jamie had a few more key wins. They were winning the Daytona 500 in 2007 and 2010. His most recent win was in 2013 at Talladega. With these accomplishments Jamie was asked to guest appear in the movie Talladega Nights. Jamie continues to race today and he is considered to be one of the top NASCAR racers. Jamie is only currently 38 years old. He still has plans to continue to race for many years. While Jamie is not racing he loves to spend time with his wife Christy and their son Carter and daughter Hazel. They have a home in North Carolina. Jamie still loves racing go karts. Jamie is also very involved with his foundation, "Jamie McMurray Foundation." His foundation helps promote awareness and raises funds for research, education, and support for people and families with autism. Jamie's still has a long career left in NASCAR. He is still competing at a very competitive level. This is why many people are considered to be his fans. Missourian’s are proud to have such a skilled NASCAR driver from their state. Joplinites are also equally proud to have Jamie McMurray call Joplin home. We all will be cheering Jamie to finish the race and see the checker flag first.